Thai Silver from the Hill Country of Thailand is famous for being handcrafted made Silver Jewelry from exotic native Hill Tribe people of northern Thailand. Thai Silver is unique and beautiful, it is made by six different Hill Tribe Clans which are located in the famed Golden Triangle region of Thailand, Laos and Burma. Thai Silver has been a way of life with the Hill Tribe people for several hundred years. Most all of the Hill Tribe people wear Thai Silver Beads and/or other types of Thai Silver such as adornments for their cloths, Silver Earrings, Rings and more. Thai Silver is known worldwide and in high demand by collectors. The Hill Country is located in the northern regions of Thailand, Chiang Mai is the largest city in the region. Chiang Mai is a beautiful city that is very ethnic, great food, friendly people and lots to do day and night. Chiang Mai has a great airport and lodging is also reasonably priced. There are many tours to the Hill Country as well as areas that produce Thai Silver that can be booked from Chiang Mai. terrain of northern Thailand, known as the Golden Triangle, where Thailand, Laos and Burma (Myanmar) intersect. The Tribes are known in Thailand as the Karen, the Hmong (Meo), the Mien (Yeo), the Akha (Kaw), the Lahu (Mussur), and the Lisu (Lisaw). All six of the Hill Tribes make Thai Silver and their Silver Jewelry is proudly worn by Hill Tribe people. Thai Silver "Hill Tribe Silver Jewelry" of Thailand is 97.5-99% pure silver, sterling silver jewelry is 92.5% pure Silver. The high Silver content of Thai Silver makes it softer than Sterling and it does not tarnish near as easy as the copper in Sterling Silver is the alloy that makes it tarnish. The fine Silver content of the metal in Thai Silver makes their Silver Jewelry unique and pleasing to the eye. The Hill Tribe Silversmiths have been respected for their Thai Silver work for centuries. They handcraft detailed jewelry components and beads from fine silver. Silver ingots are flattened into a sheet by pounding with hammers and made into wire by pulling it through ancient draw dies. Thin silver sheets are hammered into black tar molds to make shapes, then soldered and engraved. The silversmiths are able to work surprisingly fast yet there are no two pieces exactly alike. Each piece of Thai Silver has its unique, handmade characteristics and carries its own silent story of the artisan family who created it. The Thai Silver Jewelry created by the Hill Tribes are objects of classic beauty and have symbolic significance. Historically, the Hill Tribe people use Silver in place of paper money because they don’t trust the paper. They prefer silver coins, jewelry, silver ingots, silver pipes and boxes because they feel that these items always retain their value. In addition to the monetary value, wearing Thai Silver Jewelry signifies wealth, status and spirituality. If you are considering a trip to the Hill Country of Thailand, Check out our family tour business in Chiang Mai. 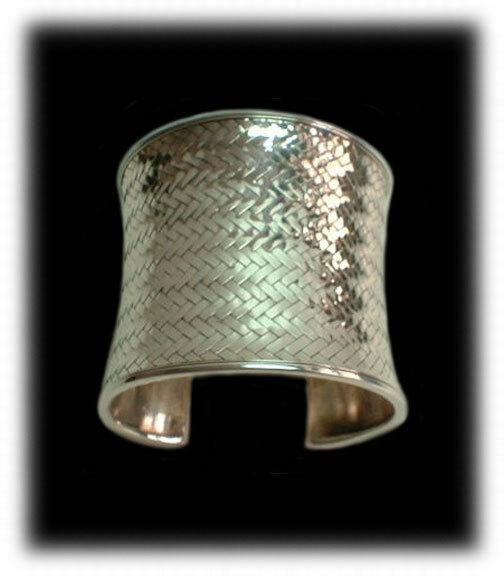 Above is a Thai Silver Bracelet made by the Karen Hill Tribe, notice the fine weave of the Silver. There are approximately 300,000 Karin in Thailand and the largest Hill Tribe. The Karin have historically been the largest producers of Thai Silver Jewelry. It is believed that they first started arriving in Thailand more than 200 years ago. Their numbers have increased dramatically over the last 50 years with many fleeing neighboring Burma (Mayamar) where the Karen are fighting for their independence. The majority of the Karen people live in Burma, and yet they also form by far the largest of the major tribes of northern Thailand. They live in bamboo houses raised on stilts, beneath which live their domestic animals, pigs, chickens and buffalos. The mountain-dwelling Karens practice swidden agriculture, and the plains-dwellers, for the most part, cultivate irrigated paddy fields. The Padaung are more commonly known as "Karen long-neck" whose women wear many tight bronze or Silver rings around their necks, they are a sub group of the Karen peoples. This practice to the younger girls although considered cruel is continuing to this day largely due to the novelty factor for tourists. The Karen are a warm friendly people and expert elephant handlers from their days when they were using the Elephants to remove logs to clear forest space for their agriculture. They are famous for their beautiful intricate Silver Jewelry. The Hmong are the second largest tribal group after the Karen. They produce their own style of Hill Tribe Thai Jewelry and their Silversmiths are well respected for their Thai Silver, worldwide. The Hmong people originally lived in the icy regions of Tibet & Mongolia. Later the Hmong migrated to Western China due to war and unrest, they than migrated to Thailand from Western China. provinces of Thailand including Chiang Mai, Chiang Rai, Mai Hong Son, Phrae, Phayao, Nan and Tak. Their succession is patrilineal and polygamy is widely practiced. The Hmong are known to be very independent and with their nomadic tendencies, they often move great distances in search of new and better land for their dry rice, corn and vegetable crops. The Hmong prefer to set their villages at high altitudes of 1000-1200m and practice shifting cultivation. The Hmong are divided in 2 main sub hill tribes, "Blue Hmong" & "White Hmong". West of Chiang Mai & Chiang Rai, we mostly find Blue Hmong hill tribes, to the east of Chiang Mai & Chiang Rai we only find White Hmong hill tribes. The Blue Hmong are the most numerous in Thailand and women wear heavily embroidered, very tightly pleated skirts. The men wear baggy black pants with various levels of bright embroidery along the cuffs and seams. The Hmong worship their ancestors and many other spirits and the village shaman is very important to the people in the village. The Hmong have supported themselves for a long time by cultivating opium poppy. The Hmong Hill Tribe people have traditionally grown opium and drug addiction to opium is high among the Hmong men in Thailand. Hmong men make Thai Silver Jewelry, crossbows, musical instruments, and other items of wood and bamboo. Hmong women are largely animistic and best known for their intricate embroidery. Their clothing is highly decorated with embroidery and ornate Thai Silver jewelry. Blue Hmong women wear beautiful pleated skirts with bands of red, blue and white intricately embroidered. The Hmong are diligent and independent people, fond of wearing their Silver ornaments during ceremonies and much devoted to the sky spirit they believe has created their own ancient way of life. The most important ceremony for the Hmong is the New Year, which is after the rice harvest, you will often see the people wearing lots of Silver at that time. The Hmong people love to wear a lot of silver jewelry such as silver necklaces, silver rings, silver earrings and/or many handmade sterling silver jewelry peices. The Yao are considered the aristocrats of the hill tribe peoples. The Yao have been making Thai Silver for hundreds of years and their people have historically worn the Thai Silver Jewelry made by Yao Silversmiths. Their villages are centered around Phayao, Chiang Rai and Chiang Mai provinces. The Yao originate from southern China, they are the only hill tribe to have a written language. Yao villages are mostly found on low hills, and their houses built usually of wooden planks. The Yao have a written religion based on medieval Chinese Taoism, although in recent years there have been many converts to Christianity and Buddhism. The Yao are considered to be the most ambitious people of the Hill Tribes, they have adapted to the way of life in Thailand and many have become very successful. They are peaceful and friendly people, who pride themselves on cleanliness and honor, they are called the 'businessmen' among the hill tribes. Yao history traces back to the ancient Chinese dynasties as a Yao princess is said to have married one of the Chinese emperors. The Yao call themselves Mien. They are linguistically grouped together with the Meo tribe in the Meo -Yao branch of the Austro - Thai family. The Akha have been in north Thailand for approximately 100 years, originating from Tibet, the Akha migrated south into Burma, Laos and Thailand. The Akha have made Thai Silver Jewelry for their own people and now produce Thai Silver Jewelry for tourists and Jewelry marketing companies throughout Thailand. The Akha of Thailand are located primarily near Chiang Rai and Chiang Mai provinces. The Akha are closely related with the Hani of Yunnan province, China. Their first settlement is thought to have been established northwest of Doi Mae Salong, at Thoed Thai. Way combines animism, ancestor worship and their deep relationship with the land.. For an Akha, the Akha Way is a way of life which extends beyond simple religious practice and infuses every aspect of their existence. The focal point of community life is the open ground at the village centre. Here, the village celebrates major festivals such as New Year, and the Giant Swing. Young men and women come to meet and mingle in this area, carefully watched by village elders. Akha women's costumes are exotic and spectacular. Of the hill tribes, the Akha women' s dress is the most elaborate and colorful. On the head they wear a helmet-like piece made up of silver coins, beads and feathers. Their body coverings are long-sleeved jackets over a embroidered cotton skirt decorated with shells. The Akha women wear a lot of Silver as the Akha Silversmiths are noted for their beautiful Silverwork. They wear large earrings, Silver ornaments on their clothing and thick rings of silver around the neck. Chiang Mai, Chiang Rai and Mae Hong Sorn. Their Thai Silver Jewelry is considerably differ ant from other Hill Tribe Thai Silver. The Lahu are believed to have originated in Tibet and then migrated down to China, Laos, Burma and Thailand. The Thai word for the Lahu is "Mussur", which means hunter, the Lahu are very adept at hunting. The Lahu houses are generally high built on stilts with walls of bamboo and the roofs are thatched grass. The villages consist of 15-30 households. Households consist of families with unmarried children, often a married daughter and family may live in the same house as well. The traditional clothing of the Lahu is black with bold embroidered patterns and bands of cloth for decoration.The Lahu believe in the soul, a house spirit, nature spirits and a supreme being. Lahu families have domestic animals like chicken, pigs and buffalos which are kept in the basement corral below their house. Lisu women in their elaborate dress - The Lisu Hill tribe also has its origins in Tibet, migrating from there to Southern China and then to Burma to escape the Chinese wars. The people of the Lisu Hill Tribe most likely migrated into Thailand from Burma sometime in the late 1800s. The Lisu Hill Tribe people live at moderate to high altitudes between Chiang Mai and Mae Hong Son, but also in western Chiang Rai and Phayao provinces of the Golden Triangle area in Thailand. Thai Silver is one of the most important crafts the Lisu make for income. The ceremonies, beliefs and customs of the Lisu are among the most fascinating of Hill Tribe peoples one can visit in Southeast Asia. They have retained their culture and autonomy remarkably well as they have been exposed to forces like missionary conversion and globalisation. Despite living close to Chiang Mai, Thailand's northern capital, these Hill Tribe people continue to follow a lifestyle which remains, in many respects, virtually identical to their ancestors in Tibet. Unlike many indigenous peoples around the world who are rediscovering their lost roots, the Lisu Hill Tribes of North Thailand have managed, to a great extent, to retain their original culture in their day to day life. The two Thai Silver pieces above were made by Karen Silversmiths of the Karen Hill Tribe of Thailand. The piece of the left is handcrafted and hand stamped Thai Silver. The pendant on the right is Jeweled Silver which is very modern for the Karen and Thai Silver. The Karen as well as the other Hill Tribe Silversmiths designs are ever changing to meet the demands of the market, however, they have styles of Thai Silver that they have made for hundreds of years that will continue on well into the future. To the left is Lisu Silver Jewelry -Thai Silver. The Lisu use a lot of stones in their Silverwork. To the right is Lahu Thai Silver Jewelry which is also a Hill Tribe and well known for their engraved Silverwork. Thai Silver is made by all six Hill Tribes and you can go to each of the Hill Tribe areas to find unique styles and designs that each Tribe makes and is known for. To the left is a antique Silver Jewelry style handcrafted and tooled Thai Silver Bracelet by the Akha Hill Tribe people. The Akha Silversmiths have been producing Thai Silver ornaments and Jewelry for hundreds of years. To the right is a Hmong Hill Tribe Thai Silver Ceremonial Necklace, this type of Thai Silver Necklace is often scene worn by many of the Hill Tribe people. It is a desirable Necklace to the Hill Tribe people. The Hill Tribe, Thai Silver Jewelry artisans are very talented and have mastered the art of Silversmithing Thai Silver. These Silver Necklaces are classic examples of Thai Silver from the Hill Tribe Jewelry. The Silver flower pin was made by hammering Silver into thin sheet, they tooling it with steel tools on a bowl of pitch. The Thai Silver Bracelet on the right was made by hand drawing Silver out into wire and then creating Silver filigree by hand. They then use a torch to solder the individual pieces together. There is a lot of tedious hand work in Thai Silver which is no problem as the Thai Silver Artisans take as much time needed to produce artistic items of great beauty. To the left is a Hill Tribe Silver Bracelet that has had Silver braided together to make beautiful ornaments. They are then cut round and wrapped with a Silver bezel edging to create a medallion effect. The Thai Silver pieces to the right are examples of unique Thai Silver ornaments made for adornments on clothing or Ceremonial regalia. The Hill Tribe Silversmiths make an abundance of Thai Silver items and generally make for their own adornments. To the left is a classic and awesome example of braided Thai Silver, this style of Silverwork has been handed down for generations of Hill Tribe Silversmiths. Thai Silver Jewelry collectors seek out fine Silver Braided Jewelry from the different Tribes as each has their own style of Thai Silver Braiding. To the right is an example of Thai Silver Repose, Silver is hammered into thin sheets and then cut and shaped in many different designs and gemstones of many types are then applied. To the left is a classic Thai Silver Ring made of tooled silver. The Silver Band is sawed out and overlay onto a backing sheet, then small handcrafted ornamental pieces are made and soldered on with a torch. The pill canister is made in a similar manor and with great skill. The Thai Silversmiths are very talented and can easily construct any shape of type of Jewelry item you could dream up. Thai Silver Earrings - Thai Silversmiths make a lot of Ethnic Earrings that are mainly made for their own people to wear. Thai Silver Earrings are very unique and individuals from outside the Hill Tribe people like them as well. You can find Thai Silver Earrings in Jewelry Shops in Chiang Mai, Chiang Rai and several other village shops throughout the Hill Country, however, you will find the most unique Thai Silver Earrings at each of the Hill Tribe villages. Published by: Thames and Hudson Ltd. This is a hardbound book with over 300 pages of information and 700 great photographs. 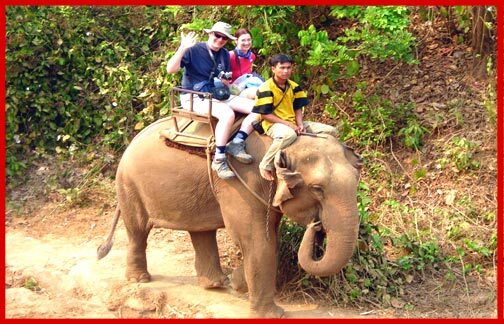 Chiang Mai Elephant Tours - If you are considering a trip to the Hill Country of Thailand, we would like to recommend Chiang Mai Elephant Tour Company. Nattarika Hartman, Dillon's wife, was born and raised in the Chiang Mai area and her family owns the Chiang Mai Elephant Tour Company. Nattarika's family have been tour guides for many years and are extremely reputable. We have sent many people over to the Chiang Mai, Thailand region and our family has taken very good care of them while they were in Chiang Mai. The Panyamoon (owners of Chiang Mai Elephants) are very well connected and can provide guides and drivers for your entire trip to the Hill Country which will make your vacation to Thailand a dream come true. Jit Panyamoon, Nattarika's father, is an awesome gentleman and he invites you to his Elephant Encampment to enjoy a day or more in the Ban Mae Win Village which is about 40 minutes from the city center of Chiang Mai. Your chauffeured drive to and from your hotel and a full day or more with the Elephants and village activities will be one of the highlights of your trip to Thailand. In the village you can ride bamboo rafts down the Mae Wang River, have a wonderful homemade meal cooked by Nattarika's mother and tour a typical Native Thai Hill Country Village. If you would like to stay in the Village for the night or more, we can arrange your stay in a beautiful new bed and breakfast lodge in the Ban Mae Win Village. For additional information in the U.S., feel free to contact Dillon and/or Nattarika Hartman from Durango Silver Company at 970 375-2401 or Dillon@DurangoSilver.com. 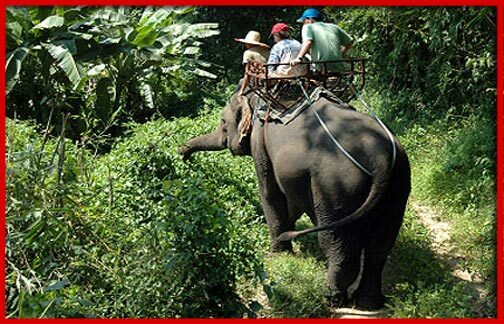 Visit the Chiang Mai Elephant Web Site for additional photos and information. To the left is a picture of John and Estell Hartman touring on an Elephant on our trip to Chian Mai, Thailand in 2007. We had a terrific time being with the Elephants and enjoying several peaceful days around them. They are beautiful animals and being with them in their natural state is so much different then viewing them at a Zoo or theme park. Jits Elephants are spectacular, friendly and the real thing! We rode the Elephants and would just hang out watching them, feeding them, washing them down and enjoying them in a natural setting. To the right was a family that were on holiday in Thailand. They flew into Chiang Mai, Jo (Nattarika's Sister) picked them up at the airport, took them to their hotel and then took them for a day tour of Chiang Mai. Jo speaks great English and taught them all the essential words and phrases they would need while in Thailand as she escorted them around. They went to several of her favourite shopping areas, had a Thai diner at a local restaurant and learned all they needed to know to get along on their own while in Thailand. We met them at the village and they exclaimed how happy they were to have found Chiang Mai Elephant Tour Company and the Pattimoon's as they totally made their trip to Chiang Mai a breeze. They then continued their trip in Thailand feeling comfortable and safe. For your information, you can stay at a great hotel in Chiang Mai for about $45.00 to $75.00 USD per night, good Thai meals at local restaurant run about $6.00 per person, and a full day guided tour with one of Jit's guides runs about $150.00 for up to three people. The daily tour is well worth it and you will be able to take it from there on your own for as many days as you would like to stay in the Hill Country area. If you wish to continue to be guided to different Hill Tribe Villages and different regions of the Hill Country, Chiang Mai Elephant Tours can arrange that as well. We hope you have enjoyed our presentation on Thai Silver and have gained some useful knowledge from it. We invite you to learn more about Turquoise and Turquoise Jewelry by following the links in our Learning Center to other informational pages that we have written on different topics related to Turquoise Jewelry. In addition, we would like to invite you to join our E-Mail Newsletter - about once every other month we send out a Newsletter to inform our members of what's happening with Durango Silver Company, new products, specials for our members and more. We also have a monthly drawing from our member base to give away free Turquoise Jewelry from our company. Please take a moment to become one of our friends by signing in below. Thank you for reading about Thai Silver.